Even though your body is about 60 percent water, you still need to make an effort to stay hydrated to keep this complex “machine” running efficiently. While the importance of water is well known, it’s estimated that about 75 percent of Americans are in a chronic state of dehydration because they only drink water when they feel thirsty. Lack of sufficient water intake can take an especially noticeable toll on the spongy discs that cushion the spine. While the centers of spinal discs (nucleus pulposus) are made up mostly of water, daily movements and wear and tear can steadily dehydrate them. Dehydrated discs are more likely to swell or lose height, which may lead to a herniated disc, nerve irritation, or damage to vertebrae. Keeping your discs hydrated can help you avoid unnecessary pain and long-term chronic issues that might require a surgical procedure, such as replacing a disc with a mobi-c artificial cervical disc. Beverly Hills residents, like many people in dry climates, don’t always understand how important hydration is for every part of the body. Here are three ways you can keep your spinal discs hydrated enough to reduce your risk of experiencing spine-related pain. As mentioned above, thirst alone is not an accurate indicator of how much water you should be drinking. In fact, by the time you drink because your body is telling you to do so, you’re already dehydrated. There’s even some debate about the standard recommendation to drink eight 8-ounce glasses of water per day. The general consensus these days is that you should drink half your body weight in ounces (e.g., 200 pounds equals 100 ounces of water per day). Strenuous activities, such as an invigorating workout or prolonged exercise, automatically place extra stress on the spine. If your spinal discs aren’t sufficiently hydrated during such activities, you could be surprised by some post-workout back pain from the resulting irritation that may be caused by disc friction. Your body has a unique way of letting you know if you’re getting enough water or not: your urine. If your urine is pale yellow or clear, it generally means your body has enough water to keep everything running smoothly. Urine that’s dark, cloudy, or producing a noticeable odor not related to underlying health issues or your diet is a sign you should be drinking more water. You may end up needing to take more bathroom breaks when you start drinking more water. However, your body will eventually adjust and you’ll get back to your normal routine. While you can get some level of hydration from soda and fruit juices, the high sugar content in beverages such as these can contribute to inflammation, which could result in back pain. Iced tea and coffee can increase your fluid levels, as long as you don’t overdo it. Fruits and veggies, some of which have water content as high as 90 percent, can also help with your hydration efforts. Being properly hydrated is a well-known part of staying healthy, and that extends to your spinal health as well. The experts at The Spine Institute know what it takes to keep your spine as healthy as possible for as long as possible. 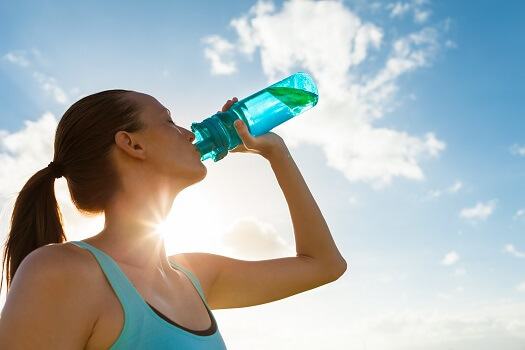 If you’re experiencing pain in your spine or neck, it may be due to dehydration, so see your Beverly Hills spine surgeon for diagnosis and treatment. Call one of our friendly representatives at 310-828-7757 today to schedule a consultation.